← How many good reasons to go to see Viviane Sassen’s work in Frankfurt? Whenever you travel to Hamburg, Deichtorhalle is a must for you photo lover. They have one of my favorite museum dedicated to photography there and their photo book shop is my pit stop. I tend to order most of my books through the Internet because they are not exactly available in Trier nor anywhere around. 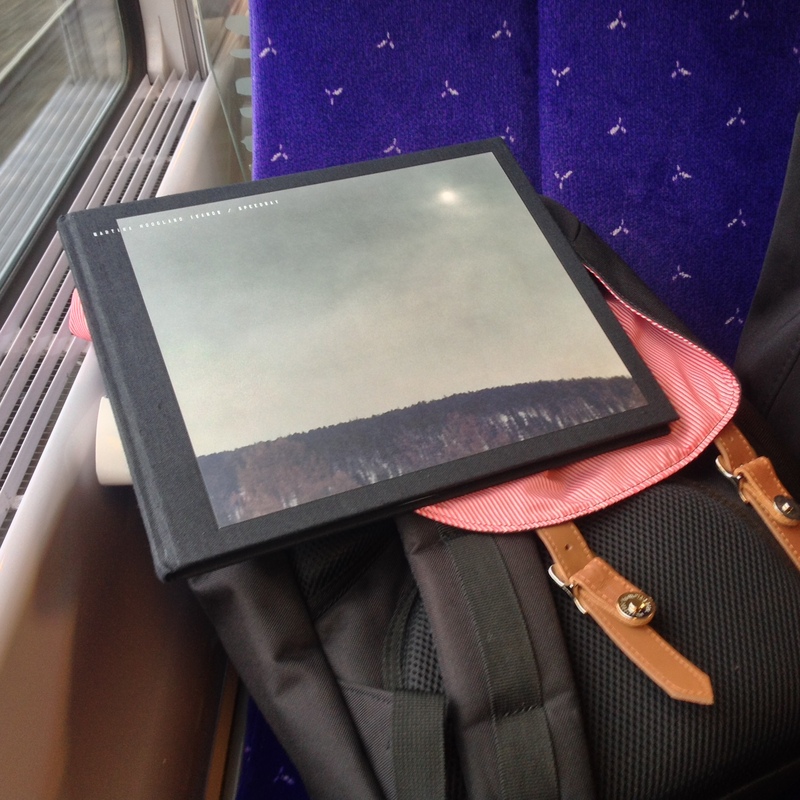 Shame shame… but I m best placed to know that it is a niche and that not many people care about photo books. But going as far as claiming a photo book shop should be open in every city is delusional. Things are slowly changing tho, partly thanks to the self-publish revolution and the remarkable work of new popping talented edition houses everywhere. To own one or two photo books nowadays is a bit like displaying Trout Mask Replica from captain Beefheart on top of your vinyls pile and pretend you enjoy the music Vaaaeeerrry much (sigh). Noobs might give you credit for that. Going to Deichtorhalle photo books store (or Motto Berlin or 25Books Berlin, name yours, there aren’t many anyway) is what we should all head for though… I m going to spare you with the saveyourlocalshop chorus, nothing new here. What remains interesting though is the IRL suggestion factor that definitely completely outmatches any online algorithm. I walk in, turn around the shop, recognizes everything, get frustrated, then simply ask the shop manager what’s cracking and end up with a bomb in the hands. 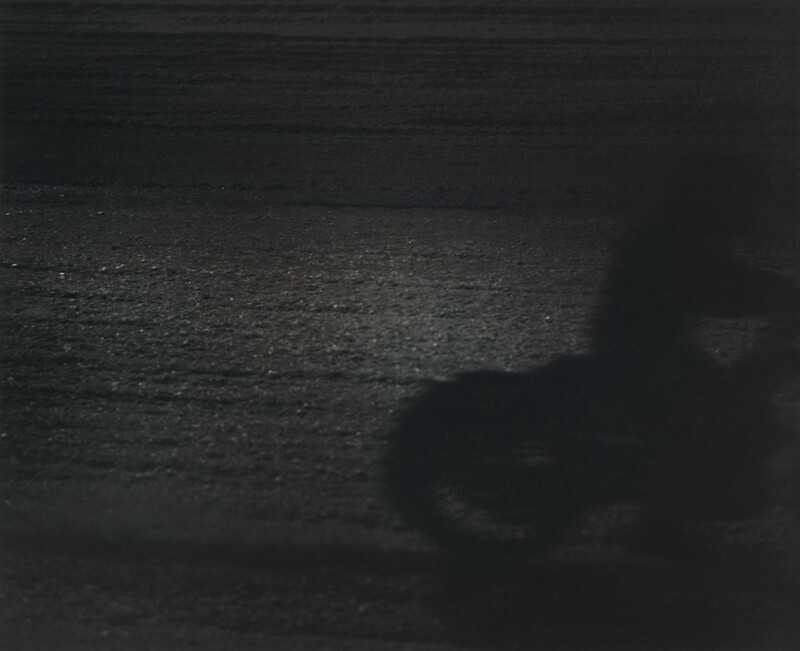 This offensive grenade is called SPEEDWAY from MARTINA HOOGLAND IVANOW and I have never heard of it before. I literally was just leaving the shop when they called me back, yelling “wait wait wait there is something here we all are in love with, something that you should see!”. He grabbed a copy of that sober book from a not so hidden pile and ironized something about the book title. Ok! So, what is this all about? Frankly at first you don’t really know… If you know what speedway is and therefore expect shiny motorbikes on a Dakota track with hot chicks taking the pose in front of sponsor signs you may be deceived (But now you know what speedway refers to). Here are dark photos printed on black paper that seems to come from some sort of black hole, sucking you in at the very first glance. 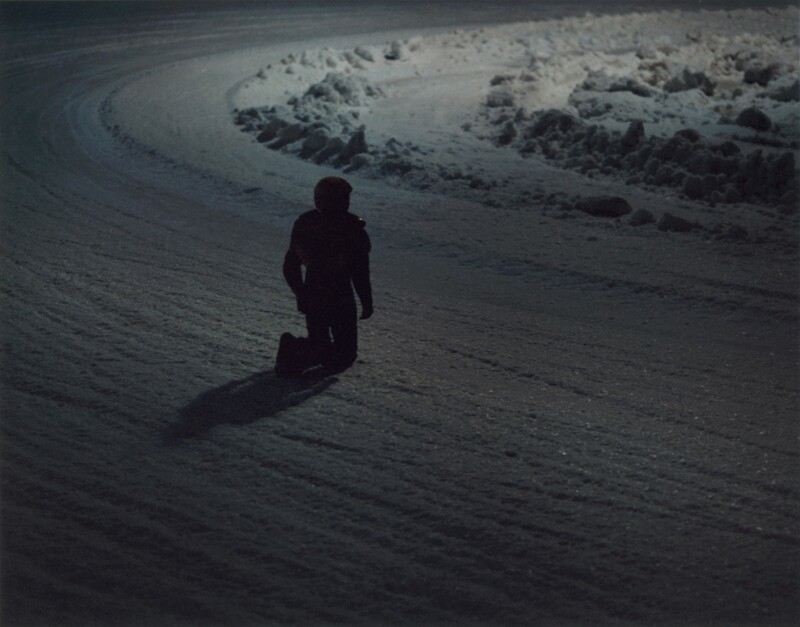 What seems first to be warriors in armor praying their last breath out in the snow, slowly turns out to be some sort of extreme northern motocross bench of pilots racing in the dark. But the gap between reality and phantasy is very thin here. Flicker the book five seconds in the busy environment of the shop and you end up in a world where the sun is for long extinguished, where people are fighting wars for survival against an unbeatable enemy. Martina does not offer you a narrative to follow, but rather a loop race track without a beginning nor an end, just as you can enter the book in the middle and escape from it by simply closing it… and come back to it later. Soldiers gathering in the shadow on one page, Shield plates hanging or ghost riders passing through the book like charging a demon there. But the nightmare does not end when closing the book. This is no phantasy but an actual Swedish race, no Mad Max delirium but an actual competition in the snow. So… close the book, raise your head look around the shop manager and his dude with a smile, look at the shop itself around you, then look away at Hamburg main station in the rain… Then look at the book cover and smile in return, cause your ten years trip in stormy Sweden hell only did last for 30 seconds max in reality. The experience is pretty much similar as reading a post-apo novel. Comparable bonds can be found in Redheaded Peckerwood in terms of immersion. Christian Patterson’s visual survey being grounded in popular culture and modern American history while Speedway digs into myths, religion and collective fears of hell and darkness. No way I could have experienced this through online flickering. As a matter of fact, the book is out since January, (edition of 666 printed books, go figure!) and I had never heard of it even remotely… And that feels very good! So, I love how the book is made (the black matte paper is a treat), the pictures are mesmerizing and even tho I am not usually even remotely connected to the motocross world, I feel deeply connected to the topic through the use of intelligent book edition techniques. Doesn’t that sound like a recommendation to you? On the downside I regret that color grading seems a bit overdone on some of the pages (especially the pilot portraits) and regret that the signed book costs 80€. Should that prevent anyone to get one of the 665 books left? Blogingly yours from luxembourg train as usual! 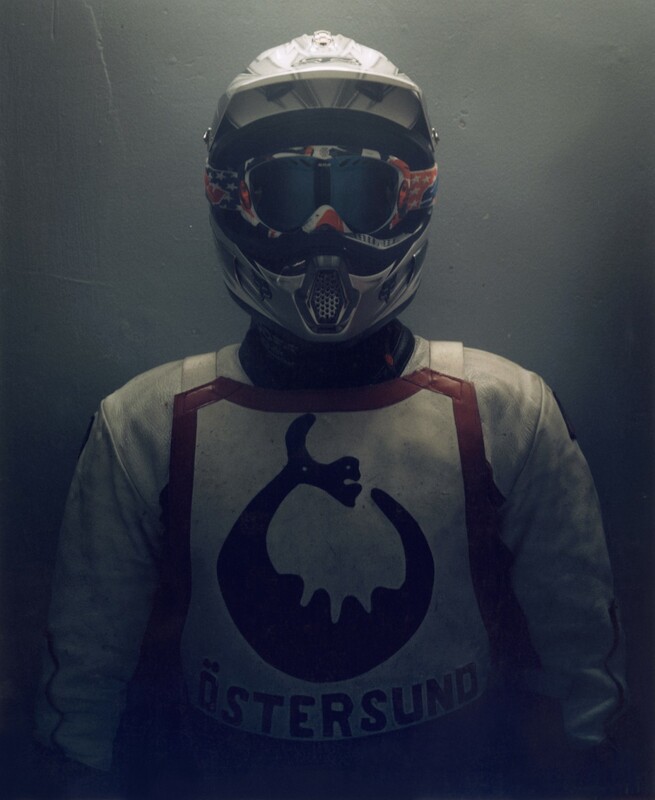 This entry was posted in fine arts, photography and tagged armor, battlefield, black, Book, dark, death, Deichtorhalle, Hamburg, hell, helmet, IRL, Luxembourg, moto, night, Photo book, photographer, Photography, post-apocalyptic, race, Review, Shop, snow, soldiers, Speedway, storm, survival, Sweden, train, war. Bookmark the permalink.